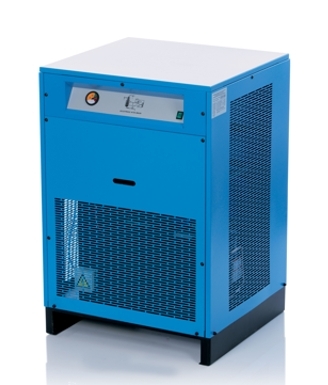 The KSI ECOTROC® KTD BASIC series of refrigeration dryers for compressed air are of compact size. The dryers' high performance, longevity and reliability are assured through the use of brand-name components. The new ECOTROC® KTD BASIC series stands out through its technology. Highly effective monoblock heat exchangers are used here. This yields a totally cost-efficient refrigerating air dryer with excellent performance features that is easy to operate and continues to operate reliably for many years. The entire series of KSI ECOTROC KTD BASIC refrigeration dryers is equipped with an automatic condensate drain as a standard feature. This ensures that condensation is discharged safely and economically. When developing the ECOTROC® KTD BASIC, priority was given to minimizing pressure losses and using high-efficiency heat exchangers and separators in order to ensure low operating costs.